Note: Its personal blog post, but to all of my friends do watch this video. MSDN Code Gallery is your destination for downloading sample applications and code snippets , as well as sharing your own resources. Logon to http://visualstudiogallery.com for latest updates on Visual Studio Extensions. This new web site will a resource center for all Visual Studio extensions. It will include everything from free VS PowerToys like tools to VSIP products. Any developer will be able to post information and a link for their Visual Studio extensions. Goal for this Visual Studio Gallery website is to give developers an easy way to find extensions for Visual Studio. that are packaged up and ready to use by the developer to improve their development experience. Describes how to plan server farms for reliability and scalability, and how to deploy Office SharePoint Server 2007 and Windows SharePoint Services 3.0 on a server farm. Describes configuration steps needed for server farms after deployment. Describes how to help control access to information and how to help protect deployments from malicious users. Describes how to set up caching, IIS compression, and other options to help maximize performance of an Office SharePoint Server server farm. Describes how to back up and recover Office SharePoint Server server farms. Provides information about common operations and management tasks. Describes how to determine requirements to support your capacity requirements. Describes how to plan for and configure search for Office SharePoint Server. 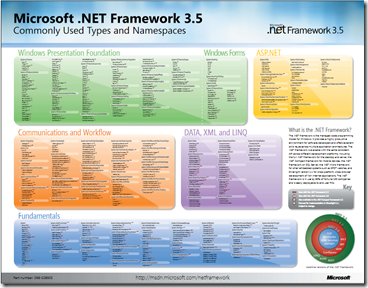 Download .Net Framework 3.5 Namespace Chart. Password Manager Program helpful for developer. For developer who switch between multiple projects to frequently can face the problem of remembering password. Its now easy with password manager. Key board Shortcut Chart for Visual Studio 2005.